A healthy diet during pregnancy ensures that your baby gets the best start possible and reduces the risk of depression after your baby is born. Good nutrition during pregnancy gives your little one all the essential nutrients he needs to grow and develop. However, eating well during pregnancy can also help your baby after it’s born, reducing its risk of type 2 diabetes and heart disease. Maintaining a healthy weight during pregnancy is also important because it makes it easier for you to carry your baby and the risk of complications at birth is lower. If you eat well and maintain a healthy weight during pregnancy, your little one is more likely to be a healthy weight both at birth and as he grows up. Here are 3 essential steps you can take to improve your diet during pregnancy starting today. Prenatal supplements aren’t really a substitute for a healthy and balanced diet, but they provide you all the vitamins and minerals you need, such as folic acid, vitamin D, calcium, iron, iodine, and zinc. Make sure that your supplement contains 400 micrograms of folic acid, which reduces the risk of neural tube defects. It is recommended that any woman who is trying to get pregnant, should take folic acid before conception and during the first 12 weeks of pregnancy. Calcium is essential for bone growth, while iron helps blood in both the mother and baby carry oxygen. Iodine is also important for a healthy thyroid function and a deficiency in iodine can cause mental disability, deafness, and stunted physical growth. Deficiency in iodine can also lead to miscarriage and stillbirth. Talk to your doctor before taking a certain type of prenatal supplement. Focus on whole foods such as fruits, vegetables, unprocessed grains, proteins, fresh herbs, and dairy products. Eating whole foods will help your baby to get the essential nutrients that it needs to develop and be healthy. Even though many women look forward to the days of pregnancy when they can eat anything they want, this is not exactly the best approach for a healthy pregnancy. When you’re pregnancy, it’s vital to eat a balanced diet loaded with natural and fresh foods. Whole foods are more nutritious and rich in antioxidants, vitamins, and minerals. Be sure to eat your vegetables with good fats which will help your body to absorb all the nutrients fruits and vegetables have to offer. Avoid highly processed and refined foods because they contain additives, preservatives, and toxins that could harm your baby. 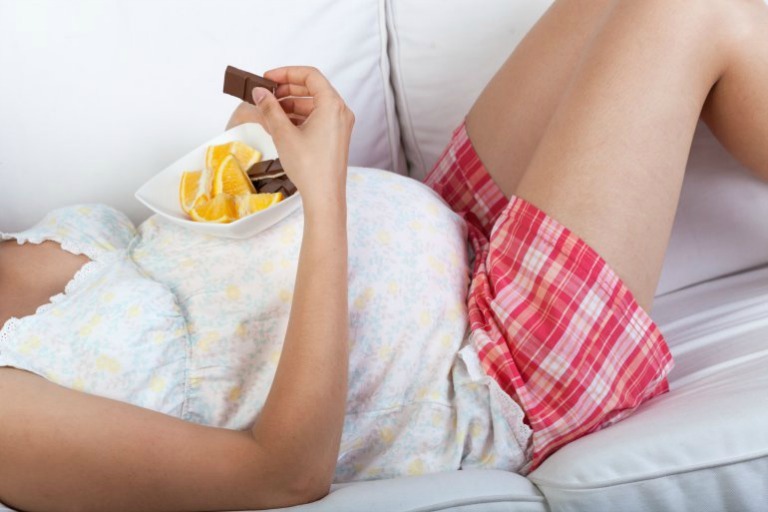 Eating healthy when you’re pregnant can be really hard, especially if you have crazy cravings. However, eating well is crucial for your unborn baby, so it’s a good idea to start cooking your own food and try to eat healthier. The pregnancy hormones are also going crazy and they are making you feel sleepy and exhausted, so probably the last thing you want to do is cook. However, when you dine out or consume processed foods, you can never be quite sure what are you eating. Cooking your own meals at home using only whole and fresh ingredients, gives you control because you are the one to decide what will end up on your plate. Cooking your own food is the best possible way to ensure healthy and safe diet for both you and your baby.